Like most women, I'm desperate to find any skin products that will improve the look of my skin, especially on my overtired face. Years of sun damage and lack of proper care have not be super kind. Add lack of sleep and stress on top of that and... well... I'm rocking some pretty serious wrinkles and bags (and apparently, that's not 'in style' ugh). I am also very prone to redness and dry skin. Awesome. This winter has been brutal on my poor face which has gotten so dry (along with the rest of me) that my cheeks are flaky (which looks amazeballs under foundation, in case you were wondering). FYI - amazeballs balls is a legit word according to my iphone. The F-bomb, not so much. I digress. 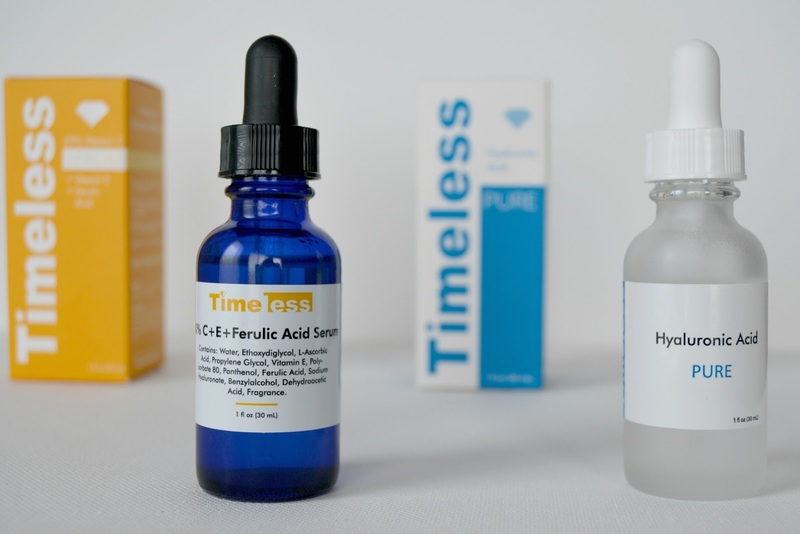 It won't surprise you that when offered to try some new products from Timeless Skin Care in exchange for a review that I jumped at the chance. If you're up to snuff on skincare products, you'll know these two serums are EVERYwhere and they are NOT cheap. Heck YES I want to try! Anti-aging treatment intended to build collagen and hydrate. I read: make me look less old and tired. 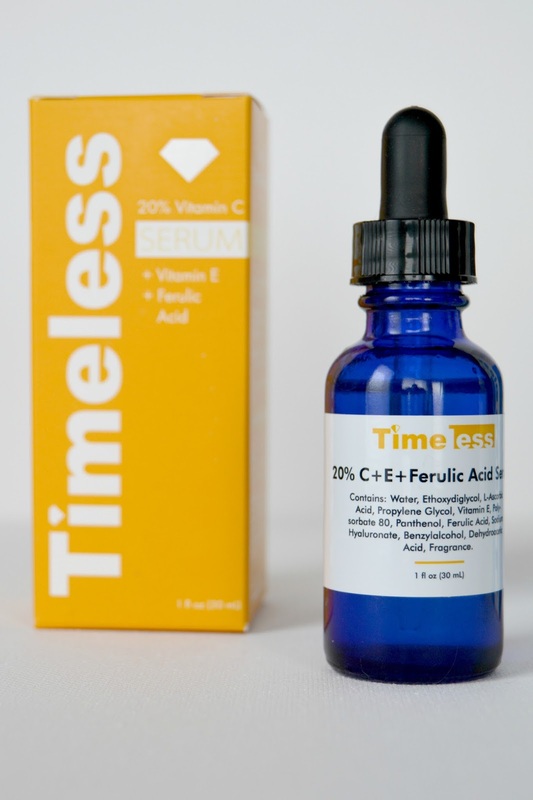 Powerful dyration that helps diminish fine lines and winkles and facilitate skin healing. I read: make me look less old and tired. Prior to using either product I did my normal cleansing and toning routine. In the morning: with a clean face I applied the Hyaluronic Acid over my entire face. I followed that with my moisturizer and then my makeup routine (which ranged from a nothing to a full-face of makeup depending on the day). In the evening: with a clean face I applied the Hyaluronic Acid to my forehead and I applied the Vitamin C Serum over the rest of my face (including under eyes). First, let me tell you I have super sensitive skin and neither of these products bothered me at all. That's kinda huge. The last time I used a new skin product I looked like I put on a bright red face mask... which I did not. 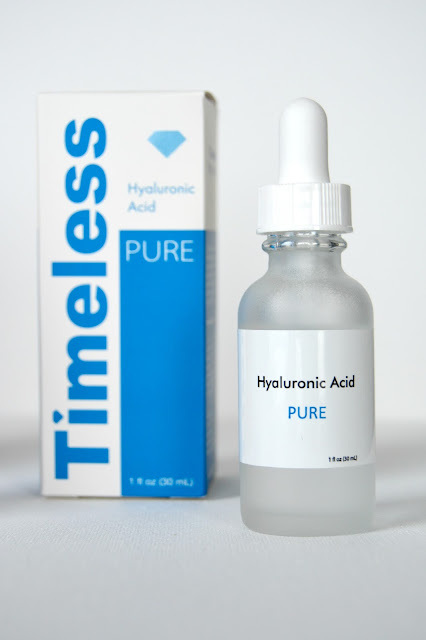 The Hyaluronic Acid is strange. It goes on almost like a gel and just kinda sits on top of your skin. I read online that you need to moisturize after using it because it helps the moisturizer do it's thing (okay, what I read was a lot more technical, but who's got time for that?). The Vitamin C Serum is a less-slimy liquid that actually goes on quite smooth and seems to absorb into your skin immediately. Moisturizer is not required after but I used it anyways as I was already putting it on my forehead (and one of the ingredients in the serum is Hyaluronic Acid) and I am too lazy it felt weird to moisturize just half of my face. I used both products for just over two weeks. I took some pics but the lighting in the before pic was terrible (sorry). It honestly looks like two different people. If you're wondering, I like the second person best. You asked. 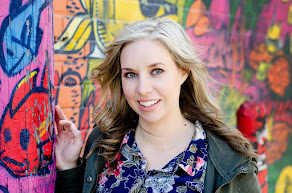 Okay, you didn't but this is my blog. Also, don't judge my brows, I had no makeup on so they had yet to be tamed. Oh and do my eyes seriously look that different with mascara on (i.e. the after pic)? Whoa. Mascara for life! Also, the benefits of good lighting. Who wants to follow me around with sunshine? Anyone? Bueller? Back on track. Here's what I noticed: dryness is GONE. For reals. My flaky skin is no more. I can only assume one or both of the products is to thank for this. My skin seems slightly less red/blotchy and my pores are a little smaller. Do I notice a significant decrease in wrinkles? Not really. Much to my chagrin, I don't look 20 years younger, which would put me at 14 and likely full of acne anyways, so this is probably a good thing. I have only used the products for just over 2 weeks. I do wonder if the longer I use the products the more difference I might notice particularly because of how much more moisture my skin is retaining now. Will I continue to use the products? Yes, my skin feels more smooth and significantly less dry. My makeup is going on so much better now that I'm not applying on dry and flaky skin. I guess what reviews boil down to are: would you buy the product again? My answer is yes. I definitely would. I noticed enough results to consider them useful AND they are at a great price point. Similar products with exact same ingredients in the same % are significantly more expensive. I also kinda love that there are no fillers in the products, they're non GMO, USA made and they don't test on animals (win, win, win).